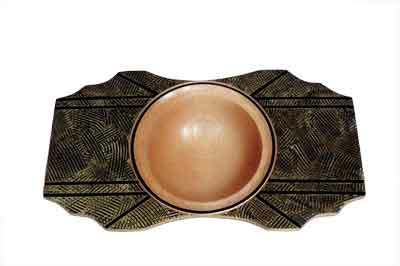 When designing a decoratively shaped bowl, such as the one shown in this project, it helps to draw outline shapes and patterns in a sketch pad. These shapes give you a visual aid for how your finished item will look. 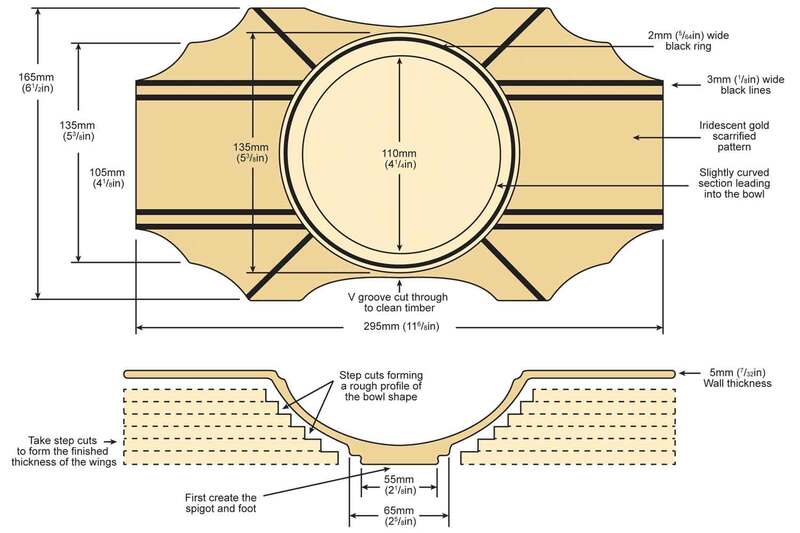 Once the desired shape has been selected, the profile can then be copied onto a length of timber the correct size. To do this, select a piece of paper the same size as the timber, fold the paper in half and then in half again. Draw a quarter of the profile on one side and cut out. When the paper is opened out, an equal pattern will emerge. 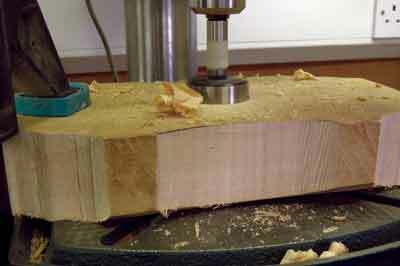 The shape is then cut into the blank, before any turning is done. The size of the internal bowl will be dependent on the width of timber being used: I chose a piece of sycamore (Acer pseudoplatanus) measuring 165 x 296 x 50mm, which allows for a reasonable size bowl. Rather than using a square piece of timber, I have used a rectangular piece, which creates two long 'wings'. 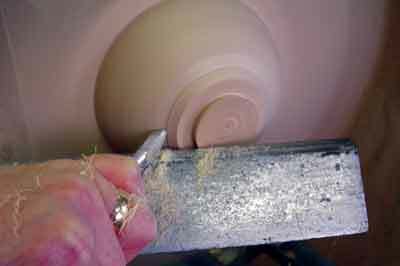 This makes the turning slightly more difficult, but produces a very pleasing shape. 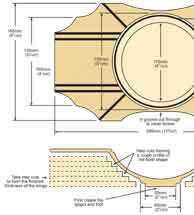 Should you wish to avoid turning uneven shaped timber, this bowl could be turned from a round bowl blank measuring 295mm in diameter and cut to shape once turned. The decoration I have applied is called 'sgraffito', which is a decorative technique used in pottery, glass and painting. 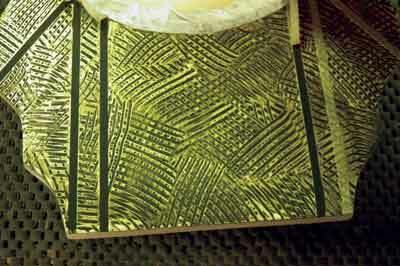 It is where two layers of different colours are used: the top layer is then scratched in to reveal the underneath colour. For this project I have used a black base colour and gold iridescent paint for the top coat. 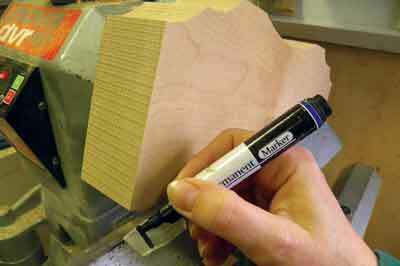 I have used a rubber 'sgraffito' comb, designed for this technique, to scratch a small straight-lined pattern through to the base coat. To give the decoration an Art Deco feel, I applied some low tac tape in straight lines leading from the edges of the wings to the start of the rim of the bowl, before applying the top coat of paint and creating the pattern. When the tape is removed, solid black lines emerge, which adds to the overall design. 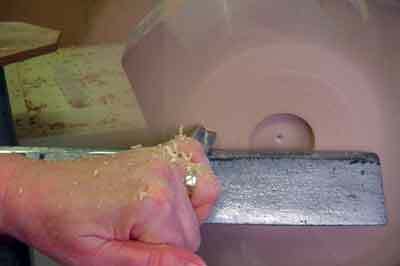 For the underneath of the bowl start cutting from the outer edge and work towards the centre, leaving step cuts where the bowl shape is to be turned. This will allow the wings to be shaped and cut to the required thickness, while still having the bulk of material left for support. 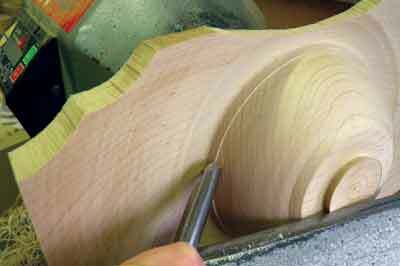 When the wings are the required thickness you can start to shape the bowl - a rough profile of the bowl shape should be evident from the step cuts being left, while cutting the wings. 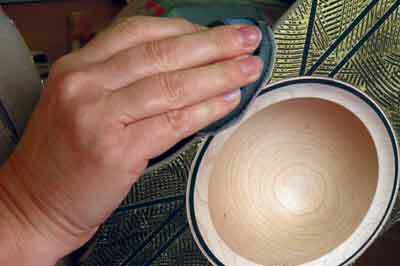 To refine the shape of the bowl, start cutting from the centre, removing the step cuts as you go. Blend the transition between the bowl and wings. 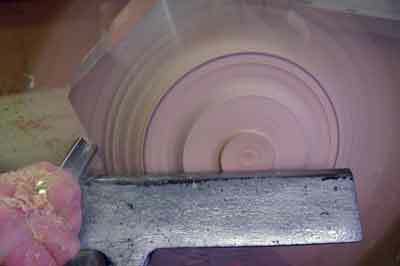 A long-grind bowl gouge is used for this. 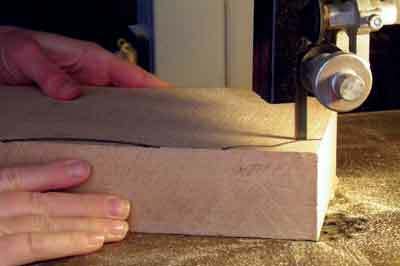 Start at the foot and using a bevel supported cut, work towards the wings. The tool is then rotated to shear scrape the solid section of the wings. This is done by rotating the flute of the tool towards the wing, lowering the handle to bring the swept-back grind of the tool into contact with the solid section of the wings. 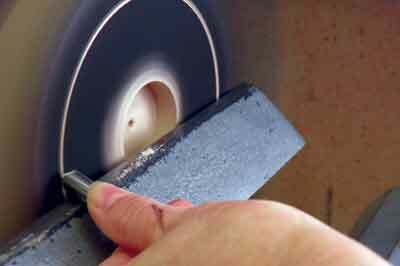 The transition from bevel supported cut to shear scraping is done in one fluid movement to create a clean cut. 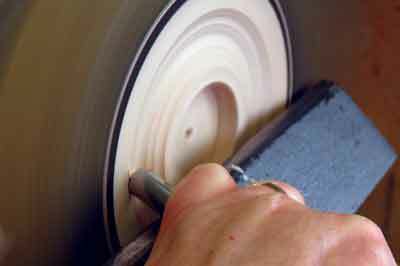 Do not shear scrape beyond the solid section of timber; this section will be hand sanded off the lathe using a sanding block. For this paint effect I have used Jo Sonja acrylic paints. I used black for the base coat and iridescent gold for the top coat. Both have been mixed with flow medium, which 'waters down' the paint without it losing its viscosity. The thinner paint allows you to achieve a smooth, flat finish. Once the base coat is dry, sand gently with 1,000 grit abrasive, this will remove any blemishes. 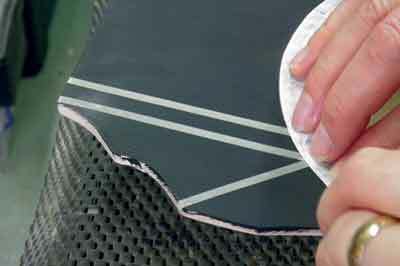 Clean the surface with tac cloth and apply some 3mm-wide low tac tape in straight lines from the outer edges to the cut groove. The tape needs to be securely adhered to the surface to prevent seepage; however, should seepage occur, this can be easily touched up with black paint once the finished pattern is fully dry. Apply some masking tape around the 'V' groove, pushing the edges into the groove; this will stop the gold paint from soiling the groove. 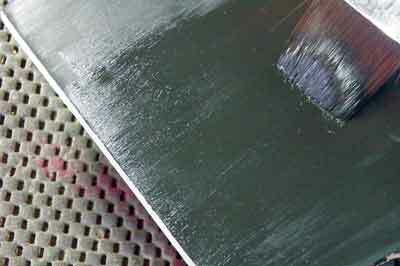 Iridescent paint is milky in appearance, only showing its colour when applied to a dark surface. If applied thickly this milky appearance remains. For the sgraffito technique a thick coat of paint is required and to prolong the working time requires mixing with flow medium. 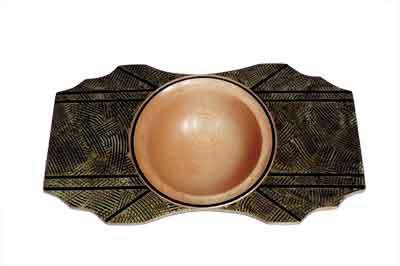 Apply to one wing at a time and create the crisscross pattern with a rubber sgraffito comb. 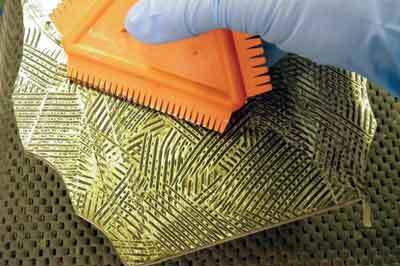 The comb removes the wet paint, leaving the base coat showing through. 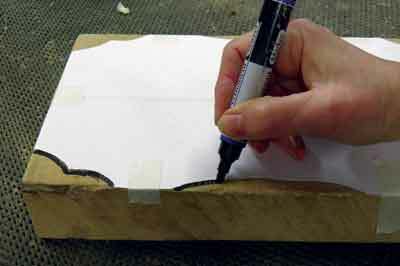 Allow the paint to dry thoroughly before removing the masking tape to reveal crisp black lines. When trying a new painting technique it helps to practice on a scrap piece of wood to help you perfect the technique before applying it to your turning. If you don't like the pattern or choice of colours you can black out and try another combination. It is very important to be aware of where your hands and arms are at all times when turning a rectangular piece of timber. The toolrest needs to be secured tightly, allowing the wood to rotate freely. Ensure your fingers, hands and arms do not hang over the toolrest at any time. 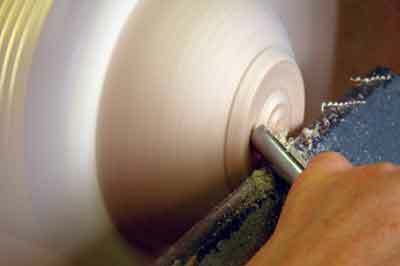 Always rotate the wood before turning on the lathe to check it does not catch the toolrest. 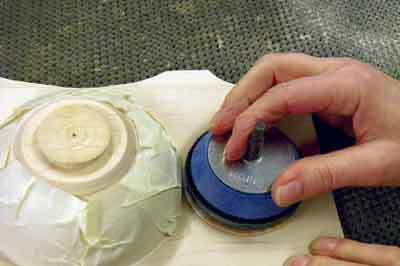 The speed of the lathe should be as fast as the lathe will allow for this amount of imbalance: the lathe should rotate the wood without vibration. I ran my lathe at 1,500rpm; however, the speed of your lathe may vary. 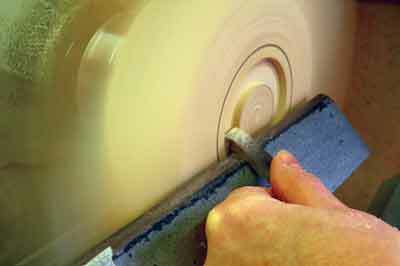 Always allow the lathe to stop rotating on its own or use a flywheel to stop it, if you have one. 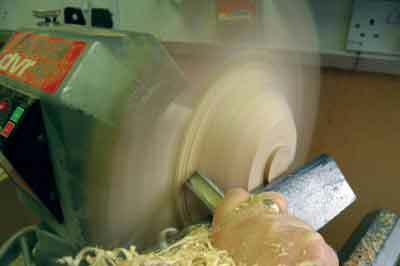 You should never try to stop the lathe by getting hold of the rotating wood, especially when the timber being turned is not round.